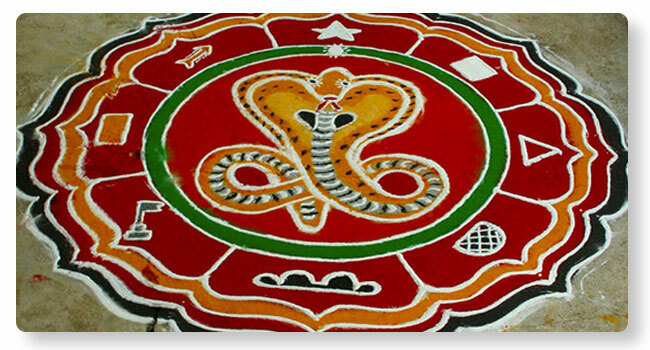 Kalasarpa Shanti is defined as a condition occurring when all the planets are positioned between Rahu and Ketu or planets are trapped in a vicious circle in a ‘Kundali’ (horoscope). This condition is termed as ‘Kala Sarpa Yoga’. Rahu is the mouth of snake and Ketu the rest of the body of a snake. Rahu and Ketu as a snake swallow all other planets in the Kundali and render them inactive. A person suffering from Kala Sarpa Yoga should perform this puja. If a child has Kala Sarpa Yoga, then parents should perform the puja. If all the hard work doesn't yield desired results, then Kala Sarpa Shanti is the best solution.